Like several fruits this year, Gravenstein apples are early. The Gravenstein Apple Fair is ten days away and many Gravenstein orchards are already approaching the end of their brief season. There should be plenty of apples for the fair but there’s a celebration coming up this Sunday, too, when the Sebastopol Farmers Market hosts its Honor the Gravenstein Day. Gravenstein day is always festive and happy, with a special sweetness to it. This year, there will be freshly-pressed Gravenstein juice for tasting, along with an apple raffle of prizes donated by vendors. Dominique’s Sweets will have fabulous Gravenstein apple pies. A balloon twister and face painter will be on hand to entertain kids. Juice will be made using apples from Walker Ranch of Graton; these apples will also be available for purchase. Lee Walker, whose grandfather, Arthur Upp, began planting apples in 1910, says it will be a short season this year. He suspects that the warm winter was to blame, as trees need a certain number of chill days each winter. “We began picking on July 17,” Walker said, adding that the apples were ready before that but the farm crew wasn’t. Picking typically begins on July 23 or 24. 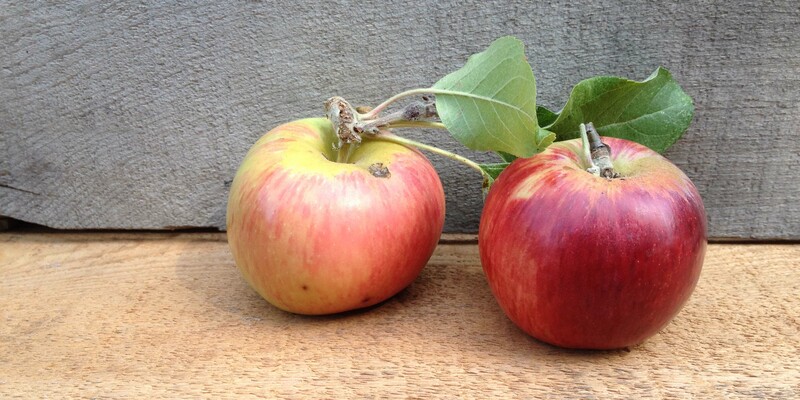 Walker grows 26 varieties of apples, with the first ripening in July and the last in November. Most are sold at the wholesale market south of San Francisco, though Walker apples are also available at the Santa Rosa Original Certified Farmers Market at the Wells Fargo Center and directly from the farm. One orchard is certified organic; the rest are farmed conventionally. If you want to enjoy Gravenstein apples, don’t wait. Get them now because soon enough they will be just a memory until next year. They are the first apple of the year to ripen but, unlike later varieties, they don’t keep well. If you have your own apples and would like to turn them into juice using the Community Apple Press, it is open this Saturday and Sunday for the pressing of Gravensteins. A project of Slow Food Russian River, the press will host its seasonal grand opening on August 15 and will remain open throughout the summer. You can make reservations for this free community service at slowfoodrr.org. The press is located at the Luther Burbank Experiment Farm (7777 Bodega Ave., Sebastopol); reservations for pressing are required. Walker Apples, founded in 1910 and owned and operated by the Walker Family, is located at 10955 Upp Rd. in Graton; to purchase apples direct from the farm, call 823-4310. The Sebastopol Farmers Market takes place on Sunday from 10 a.m. to 1:30 p.m. in the Sebastopol Plaza, at the corner of Petaluma Ave. and McKinley St.
Michele Anna Jordan has written 24 books to date, including the new “Good Cook’s” series. Email Jordan atmichele@saladdresser.com. You’ll find her blog, “Eat This Now,” at pantry.blogs.pressdemocrat.com.